Wait, am I going to keep getting handsomer and handsomer? Really? That doesn't seem right. Yet, every morning in the mirror, there's the proof staring back at my handsome face. My laugh lines are getting laughier. And, my chiseled jawline has become more chiseled. I swear my smile twinkles with even more rakish charm than just last week. It has to level out at some point. Right? I mean … right? See? There's a definite upturn in the last few years. 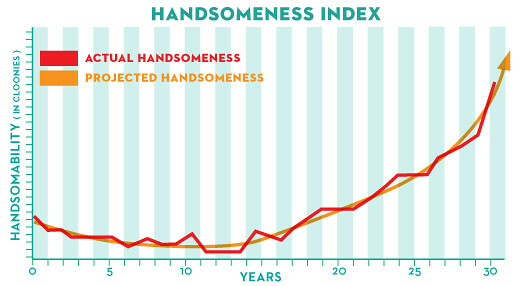 What happens if I never stop getting handsomer? At some point, my handsomeness might reach dangerous levels. Will these piercing blue eyes become too piercing? My lips too kissable? Will my nose become too noble, too regal? I worry … But, darn it, even these worried wrinkles make me look more pensively attractive! Damn you, Fate, for making me your culminating masterpiece! DAMN YOU!!! The burden is too much to bear, even on these naturally broad shoulders—shoulders at once both masculine and comforting. I’ve tried to slow the process of handsome-ifying. I changed my facial moisturizing regimen to every other day. I’ve bought store brand beard conditioner. I’ve allowed people to see me wearing my reading glasses. Nothing seems to work. The only thing that’s happened is that my handsomeness has morphed into rugged handsomeness. I’m sorry. It seems there’s nothing I can do to stave off the inevitable. If you see me walking down the street, please avert you eyes. I don’t need your pity. Nor your wolf whistles.